Coffee Leaf Rust (CLR), caused by Hemileia Vastritix, is a fungus that attacks coffee plantations worldwide, leading to leaf loss, loss of harvest and, in severe cases, long-term damage to coffee plants. During the 2012-2013 growing and harvest season, this fungus caused massive economic losses to farmers throughout Latin America, with some farmers losing as much as 90 percent of their harvest. 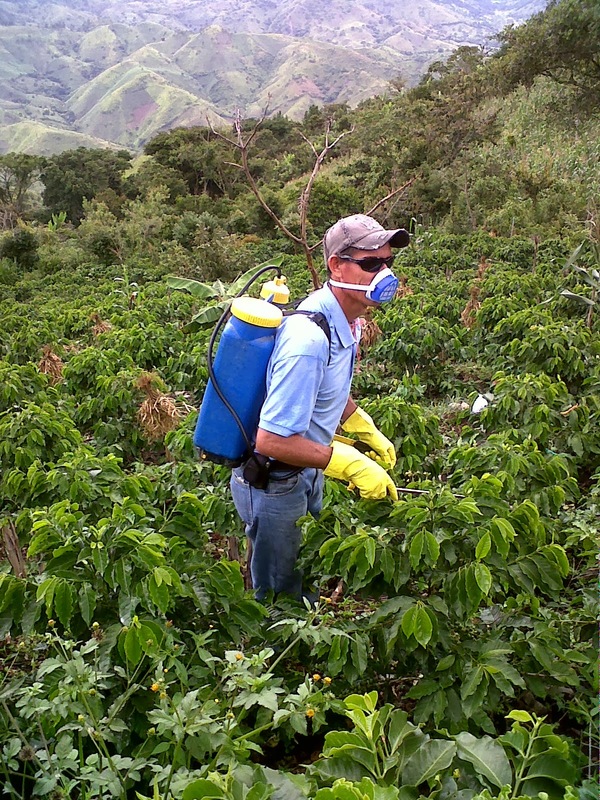 In response to the continuing problem that farmers face in dealing with CLR, UMF is performing an experiment to evaluate different inorganic (chemical) fungicides as well as potential organic treatments, with the goal of finding organic treatments that can serve to control the rust and prevent future damage to the farmers of La Unión. Chemical fungicides are very expensive and, following the loss during last year’s harvest, many of the farmers in UMF’s program have been unable to purchase proper treatments. Additionally, these chemical fungicides have been shown to have harmful effects on the health of farmers that spray them, even more so since access to proper protective equipment is difficult for small-scale farmers. And finally, chemical fungicides have been shown damaging to the environment, wildlife, and water sources. The discovery of organic alternatives to chemical fungicides holds the potential to address all three of these issues. Martir checks each leaf on a selected branch. The way that we are running this experiment is relatively simple—select different areas of a farm, apply different treatments to each of those sections, and monitor results. We are working on the farm of long-time UMF client Amado Reyes for this experiment. In the last week of August, we took initial samples of each area of Amado’s farm. These samples will serve as a baseline for the effects that chemical and organic treatments have on CLR. We then sprayed the first round of treatments on each area. The chemical fungicides that we are using are copper, Silvacur, and Alto 10. These are the three most recommended fungicides currently available in the area. The organic treatments that we are using are milk whey, sodium bicarbonate (baking soda), and madrifol. Milk whey is widely available from dairy farmers in the area as a waste product from producing cheese. This means that farmers are able to attain it without cost. Whey has been shown to have effects as good as, or in some cases better than, chemical treatments when applied to powdery funguses in grape vineyards and cucumber farms. The powdery funguses that attack grapes and cucumbers are not coffee leaf rust, but they have similar structure. This leads us to believe that there is a high likelihood that whey will be able to control rust outbreaks in coffee. Gilberto sprays copper on one section of plants. Sodium bicarbonate, otherwise known as common baking soda, has proven capable of different levels of control of powdery funguses in crops such as roses and grape vineyards. We are hopeful that the same mechanisms control powdery funguses in other plants will prove effective when applying sodium bicarbonate to control coffee leaf rust. Madrifol is a locally-made fermented mixture of ground leaves from Madreado trees and wood ash. Although there haven’t been any scientific studies showing whether madrifol is effective, it is used as an anti-fungal in different applications in Honduras. The added wood ash contains bicarbonates (similar to those in baking soda), other organic salts shown to be effective in controlling powdery funguses, and small amounts of copper. We are unsure of the expected outcome of this treatment, but this home-made remedy has long use in Honduras, and we are hopeful that it will be effective when applied to coffee. We will continue spraying organic/inorganic treatments and monitoring the progression of CLR in each of the separate treatment areas over the coming months. We believe that this experiment is the most important way that UMF can support both farmers and the environment in La Unión as coffee leaf rust outbreaks continue in coming years. We will keep you updated on the progress as we go. To view photos of our first data collection on the farm, visit our Facebook album here.